This morning I found out about a brand new interview series available via Bloomberg called the David Rubenstein Show. The first episode was broadcast on October 17, 2016, and contains and interview with Bill Gates. Over at the Bloomberg site the show is described in the following way. The interview is about 25 minutes and is time well spent. To be honest, there’s not much of news here. But, listening to Bill is usually very interesting. Topics discussed range from Microsoft, Harvard, bridge, Warren Buffett, and philanthropy, among others. I have transcribed the part of the interview where Bill talks about his relationship and friendship with Warren Buffett. This part starts at about fifteen into the interview and goes on for about 3-4 minutes. DAVID ROSENSTEIN: When your mother first said: “I’d like you to come and have dinner with me, and Warren Buffett will be here. You should meet him.” You didn’t seem that interested. Why was that? BILL GATES: Warren, I though was somebody who bought and sold securities which is a very zero-sum thing. That’s not curing disease or cool piece of software. And the idea you know of looking at volume curves, it doesn’t invent anything. So I thought my way of looking at the world, what I wanted to figure out and do to what he looked at, it wouldn’t be much intersection. And that’s why it was so shocking when I met him. He was the first person to really ask me about software, and software pricing, and why wasn’t IBM with all of their strength able to overwhelm Microsoft. What was gonna happen in terms of how software would change the world? And, you know, he let me ask him about why do you invest in certain industries, and why are some banks more profitable than others. Yet, he was clearly a broad systems thinker. And so it started a conversation that has been fun and enriching. You know, an incredible friendship that was completely unexpected. DAVID ROSENSTEIN: He taught you how to play bridge or did you already know? BILL GATES: I knew how to play bridge but I hade done it just… our family had done it. And then because it was a chance to spend time with Warren I renewed my bridge skill, at first really poorly. But both golf and bridge were things that we did in our hours that we got to goof off together. DAVID ROSENSTEIN: You’ve given up on golf? BILL GATES: Well, Warren gave up on golf a few years ago. So my primary excuse to play golf has gone away, so I’m golfing not much now. Tennis has become my primary sport. DAVID ROSENSTEIN: Warren Buffett called you one day and said: “By the way, I’m gonna give you most of my money.” Were you surprised when he said he wanted to give you all his money from his wealth to your foundation? BILL GATES: That was a complete surprise because Warren is the best investor, and he’s built this unbelievable company, and he was giving me advice about all the things I was doing. I was learning so much from him. But his wealth was devoted to a foundation that his wife was in charge of. And so tragically she passed away, and so then he had to think that his initial plan wouldn’t make sense. And much to my surprise he decided that a part of his wealth, a little over 80 percent would come to our foundation. So it was a huge honour, a huge responsibility, and an incredible thing because it let us raise our level of ambition even beyond what we would have done without that. You know, by most definitions, the most generous gift of all time. In his 2005 letter to shareholders Warren Buffett discussed the topic of competitive advantage, or moats in his own words (emphasis added). When our long-term competitive position improves as a result of these almost unnoticeable actions, we describe the phenomenon as “widening the moat.” And doing that is essential if we are to have the kind of business we want a decade or two from now. We always, of course, hope to earn more money in the short-term. But when short-term and long-term conflict, widening the moat must take precedence. If a management makes bad decisions in order to hit short-term earnings targets, and consequently gets behind the eight-ball in terms of costs, customer satisfaction or brand strength, no amount of subsequent brilliance will overcome the damage that has been inflicted. Take a look at the dilemmas of managers in the auto and airline industries today as they struggle with the huge problems handed them by their predecessors. Charlie is fond of quoting Ben Franklin’s “An ounce of prevention is worth a pound of cure.” But sometimes no amount of cure will overcome the mistakes of the past. Our managers focus on moat-widening – and are brilliant at it. Quite simply, they are passionate about their businesses. Usually, they were running those long before we came along; our only function since has been to stay out of the way. If you see these heroes – and our four heroines as well – at the annual meeting, thank them for the job they do for you. But, as sure as times change, the same goes for moats. So, if you manage to identify a moat that you may even assess as sustainable, remember that nothing lasts forever, not even wide moats (at least I’d say that’s the most probable and likely outcome if you were asked to make a bet on any given business). As an example, let’s take a look at the newspaper industry and how it has changed during the latest decades. Warren has been largely restricting himself to companies which he feels offer some protection against inflation in that they have a unique product, low capital needs and the ability to generate cash. Warren likes owning a monopoly or market-dominant newspaper to owning an unregulated toll bridge. You have relative freedom to increase rates when and as much as you want. To read the WSJ article, click here. Going back through the years and the letters to shareholders written by Warren, we find an extensive discussion about the state of the newspaper industry in his 2012 letter (emphasis added). We Buy Some Newspapers . . . Newspapers? 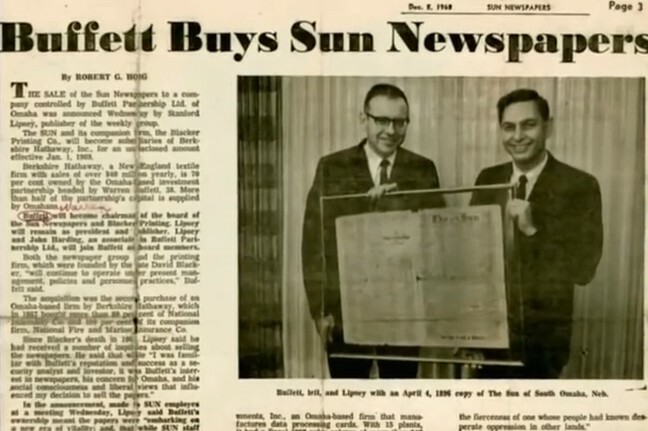 During the past fifteen months, we acquired 28 daily newspapers at a cost of $344 million. This may puzzle you for two reasons. First, I have long told you in these letters and at our annual meetings that the circulation, advertising and profits of the newspaper industry overall are certain to decline. That prediction still holds. Second, the properties we purchased fell far short of meeting our oft-stated size requirements for acquisitions. We can address the second point easily. Charlie and I love newspapers and, if their economics make sense, will buy them even when they fall far short of the size threshold we would require for the purchase of, say, a widget company. Addressing the first point requires me to provide a more elaborate explanation, including some history. News, to put it simply, is what people don’t know that they want to know. And people will seek their news – what’s important to them – from whatever sources provide the best combination of immediacy, ease of access, reliability, comprehensiveness and low cost. The relative importance of these factors varies with the nature of the news and the person wanting it. Before television and the Internet, newspapers were the primary source for an incredible variety of news, a fact that made them indispensable to a very high percentage of the population. Whether your interests were international, national, local, sports or financial quotations, your newspaper usually was first to tell you the latest information. Indeed, your paper contained so much you wanted to learn that you received your money’s worth, even if only a small number of its pages spoke to your specific interests. Better yet, advertisers typically paid almost all of the product’s cost, and readers rode their coattails. Additionally, the ads themselves delivered information of vital interest to hordes of readers, in effect providing even more “news.” Editors would cringe at the thought, but for many readers learning what jobs or apartments were available, what supermarkets were carrying which weekend specials, or what movies were showing where and when was far more important than the views expressed on the editorial page. In turn, the local paper was indispensable to advertisers. If Sears or Safeway built stores in Omaha, they required a “megaphone” to tell the city’s residents why their stores should be visited today. Indeed, big department stores and grocers vied to outshout their competition with multi-page spreads, knowing that the goods they advertised would fly off the shelves. With no other megaphone remotely comparable to that of the newspaper, ads sold themselves. Even a valuable product, however, can self-destruct from a faulty business strategy. And that process has been underway during the past decade at almost all papers of size. Publishers – including Berkshire in Buffalo – have offered their paper free on the Internet while charging meaningful sums for the physical specimen. How could this lead to anything other than a sharp and steady drop in sales of the printed product? Falling circulation, moreover, makes a paper less essential to advertisers. Under these conditions, the “virtuous circle” of the past reverses. The Wall Street Journal went to a pay model early. But the main exemplar for local newspapers is the Arkansas Democrat-Gazette, published by Walter Hussman, Jr. Walter also adopted a pay format early, and over the past decade his paper has retained its circulation far better than any other large paper in the country. Despite Walter’s powerful example, it’s only been in the last year or so that other papers, including Berkshire’s, have explored pay arrangements. Whatever works best – and the answer is not yet clear – will be copied widely. In a the recent Politico Playbook interview Warren Buffett shared his bearishness on newspapers. 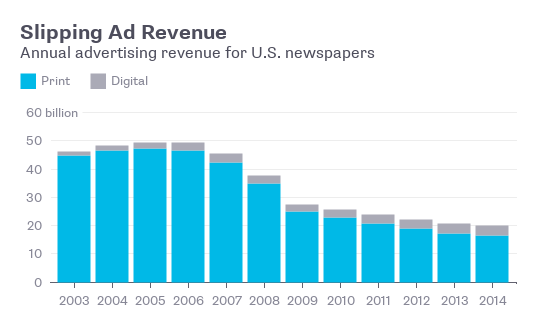 The table below shows how advertising revenue has declined between 2003 and 2014. A slide that most likely is going to continue. It has been evident for several years that the financial realities of the web are not friendly to news entities, whether legacy or digital only. There is money being made on the web, just not by news organizations. Total digital ad spending grew another 20% in 2015 to about $60 billion, a higher growth rate than in 2013 and 2014. But journalism organizations have not been the primary beneficiaries. In fact, compared with a year ago, even more of the digital ad revenue pie — 65% — is swallowed up by just five tech companies. None of these are journalism organizations, though several — including Facebook, Google, Yahoo and Twitter — integrate news into their offerings. And while much of this concentration began when ad spending was mainly occurring on desktops platforms, it quickly took root in the rapidly growing mobile realm as well. In hindsight, everything looks pretty clear, right? The trick is being able to continuously evaluate businesses and industries and identify any data that may indicate a coming, or ongoing, moat-erosion. But that’s some topic for another post. Even though this blog post was about the past, the key take-away from it is that moats change, and we gotta be aware of this and make the best we can out of it we look into the unknown future. At least if we’re hunting for, and investing in, companies supposed to enjoy sustainable competitive advantages. How to go about when performing a business analysis, and what to look for in doing so, is nothing but the holy grail of investing. A business analysis could be carried out in a number of different ways. You just have to make sure that you have a way that works for you, a process for analyzing and evaluating businesses that is continually updated along the way as you learn about new facts and circumstances. To be able to value a business, you have to understand the business. And to be able to say that you understand a business you would likely want to know about its products/services and revenue sources, operating leverage, financial leverage, competitive position, industry characteristics, etc. 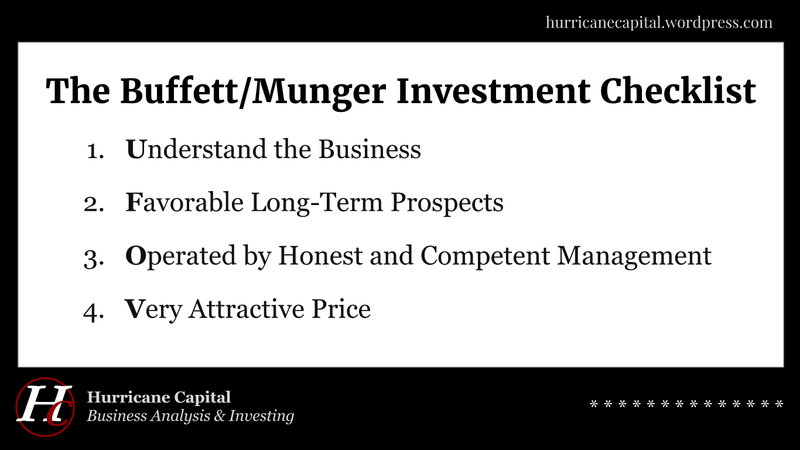 These questions all belong to the first section of the Buffett/Munger Investment Checklist, i.e., understanding the business. When you understand a business and its management, and have evaluated the long-term prospects as favorable, the next step is to value the business, i.e., come up with an estimate of intrinsic business value that is to be compared to the current market price of the business. If you manage to, and have the luck, to check each of the four main parts of the checklist, you most likely have an investment worth making. In his 1977 letter to shareholders Warren Buffett explained his and Charlie’s process for analyzing and evaluating businesses. We select our marketable equity securities in much the same way we would evaluate a business for acquisition in its entirety. We want the business to be (1) one that we can understand, (2) with favorable long-term prospects, (3) operated by honest and competent people, and (4) available at a very attractive price. We ordinarily make no attempt to buy equities for anticipated favorable stock price behavior in the short term. In fact, if their business experience continues to satisfy us, we welcome lower market prices of stocks we own as an opportunity to acquire even more of a good thing at a better price. So, already back in 1977 Warren Buffett laid out the checklist that he and Charlie go through when evaluating a business. This will serve as a good starting foundation for anyone who wants to build their own investment checklist. Each checklist point could then be expanded to included a number of supporting sub-questions needed for coming up with a conclusion about the “main” checklist question being evaluated. The mantra “understand the business before you invest in it” may seem like a trivial statement. But it’s not. I have done it myself, and I guess that many of you know what I’m talking about. Sinned by buying shares in a business I didn’t understand good enough (I say enough, since you cannot know everything—at some point you have to make a buy/sell decision or just move on). It’s easy to buy shares in a business before having collected enough facts about the situation and circumstances at hand. Psychological factors and emotions often play too big a role when it comes to buying and selling shares. Understanding why it is important to know the fundamentals of a business before investing in it most likely seems like a no-brainer to most of us—at least in theory. The hardest part, I guess, is to live as you learn. To start with, you have to understand yourself. Never fool yourself. Easier said than done, I know, but that doesn’t make it less relevant. It probably makes it even more important to repeat it time and time again. Becoming aware of the problem in situations like these is the first step. We all need to be aware of things before we can do our best to address them. Except for the business, you need an understanding of the industry—the playing field where competitors battle each other. This is where the fight for profits takes place. The inherent industry structures will impact the way in which incumbent businesses compete, and also whether any entry and exits is likely to happen. The inherent industry characteristics differ between different industries in terms of entry barriers, number of competitors, profitability, growth, number of competitors, competitive advantages (or moats) and returns on invested capital etc. Beyond understanding the business, an understanding of the industry is highly critical since it will impact the profit and return potential. Understanding the industry could of course be part of “understand the business.” Anyway, understanding a certain business most likely requires basic understanding the industry (or industries) in which it operates. All this talk about “understanding” has one, and only one goal in the end, to mitigate the risk of a permanent loss of capital. Now that we’ve discussed the importance of understanding the business and the industry, a fair question to ask is; How do you obtain this understanding? As always, you have to start somewhere. You have to start building your own circle of competence. No one will do it for you. In this post we will take a closer look at the retail industry, too learn what this industry looks like, what could be expected from a retailer, the likely returns on invested capital, the degree of competition, among other things. For now, we’ll leave the part about understanding the business. Let’s improve our understanding of retailing and the retail industry in general. Basically, everything you read could give you hints and improve your knowledge and understanding of the things at play in a certain area. Your knowledge data base (your brain) will accumulate new facts along the way, building on the things you’ve processed earlier, hopefully replace any facts that turned out to be wrong. All this in an attempt to increase and improve your skills when it comes to industry structure, profitability, returns on invested capital. The more you learn, the better you will get at detecting differences between industries and businesses, and also understand why there are differences—what forces can explain and sometimes even predict what happens. Some industries are inherently more attractive (that is, more likely to provide sustainable above-average returns on invested capital) than others. The above examples are just that, examples. There is a ton of stuff to learn from that I didn’t include. Someone who’s been in the investing game for some time is Warren Buffett. And when it comes to investing in retailer even Buffett has his fair share of, let us say less satisfactory results. Let’s see what Buffett himself has to say about the difficulties an investor could encounter in this area. Nobody knows. Eddie is a very smart guy but putting Kmart and Sears together is a tough hand. Turning around a retailer that has been slipping for a long time would be very difficult. Can you think of an example of a retailer that was successfully turned around? Broadcasting is easy; retailing is the other extreme. If you had a network television station 50 years ago, you didn’t really have to invent or being a good salesman. The network paid you; car dealers paid you, and you made money. Retailing is like shooting at a moving target. In the past, people didn’t like to go excessive distances from the street cars to buy things. People would flock to those retailers that were near by. In 1966 we bought the Hochschild Kohn department store in Baltimore. We learned quickly that it wasn’t going to be a winner, long-term, in a very short period of time. We had an antiquated distribution system. We did everything else right. We put in escalators. We gave people more credit. We had a great guy running it, and we still couldn’t win. So we sold it around 1970. That store isn’t there anymore. It isn’t good enough that there were smart people running it. It will be interesting to see how Kmart and Sears play out. They already have a lot of real estate, and have let go of a bunch of Sears’ management (500 people). They’ve captured some savings already. We would rather look for easier things to do. The Buffett grocery stores started in Omaha in 1869 and lasted for 100 years. There were two competitors. In 1950, one competitor went out of business. In 1960 the other closed. We had the whole town to ourselves and still didn’t make any money. Retail is a tough game to play, or as Buffett says; “Retailing is like shooting at a moving target.” Buffett’s advice? “We would rather look for easier things to do.” Let’s look at one more before we move on (emphasis added). One of the books mentioned above is a book written by Pat Dorsey—The Five Rules for Successful Stock Investing. There is a section in this book that discusses and goes through a number of different industries, of which one is retail (as part of consumer services). The remaining part of this post will focus on the consumer services sector, and more specifically retail. We will do this by reading the part about retail. Below is an excerpt from the Five Rules of Successful Investing, explaining and discussing the industry fundamentals and some of the pros and cons of retailing (emphasis added). NOT SURPRISINGLY, WE generally don’t find a ton of great long-term stock ideas in retail and consumer services because most economic moats for the sector are extremely narrow, if they exist at all. The only way a retailer can earn a wide economic moat is by doing something that keeps consumers shopping at its stores rather than at competitors’. It can do this by offering unique products or low prices. The former method is tough to do on a large scale because unique products rarely remain unique forever. It’s rare to find a retailer or consumer service firm that maintains any kind of economic moat for more than a few years. The retail game has undergone a major facelift over the past two decades. First came the development of category killers, with specialized merchandise and service. Chains such as Home Depot and Lowe’s put many smaller, regional players out of business in the home improvement area. In 1992, the two firms posted combined sales of $8 billion; in 2002, they sold more than $80 billion worth of nails, hammers, and appliances. Office Depot, Office Max, and Staples did the same thing to the office supply business in the late 1980s and 1990s. The second major shift has been the move off the mall. Once upon a time, department stores were infallible in the world of retailing. Well-known chains such as Sears that were once destinations in their own right became the anchor tenants for malls. The stores aimed to provide customers with a one-stop shopping experience, and some even housed full-service restaurants. Customers had more time to shop and placed more value on the personal attention these stores provided. Over the past 20 years, however, traditional department stores have become dinosaurs. Nowadays, companies such as Sears and JC Penney are struggling to remain relevant—a battle that chains such as Montgomery Ward and Woolworth have already lost. Changing consumer trends are largely, but not totally, to blame. In this era of dual-income households, shoppers want selection, quality, and reasonable prices, and they want it fast. And they’ve shown a willingness to shift their spending to stores that can provide this experience. Firms such as Wal-Mart, Target, and Kohl’s have stolen the thunder of the traditional department stores with innovation and efficiency. These are the firms that developed everyday low prices, pioneered centralized checkouts at the front of stores, and set up shop in freestanding locations with more convenient parking. Whereas, Sears and Penney averaged 0 percent and 1 percent annual sales growth, respectively, from 1998 to 2002, Wal-Mart, Target, and Kohl’s averaged 15 percent, 10 percent, and 24 percent, respectively. Over the next several years, we expect this divergence to continue. One of the best ways to distinguish excellent retailers from average or below-average ones is to look at their cash conversion cycles. 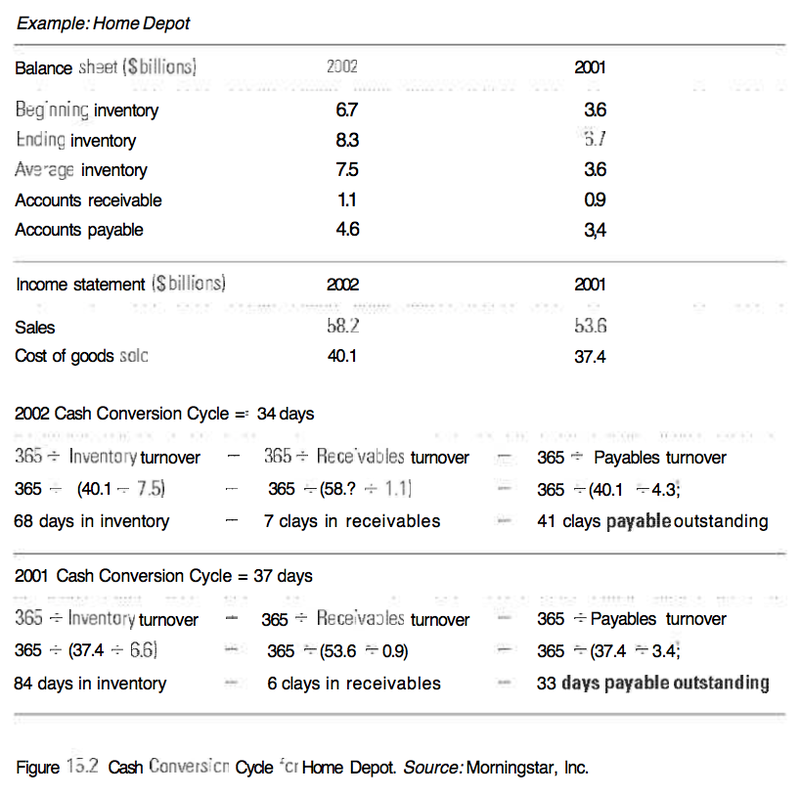 The cash cycle tells us how quickly a firm sells its goods (inventory), how fast it collects payments from customers for the goods (receivables), and how long it can hold on to the goods itself before it has to pay suppliers (payables). Figure 15.1 illustrates the cash conversion cycle, and Figure 15.2 shows the conversion cycle for Home Depot. Naturally, a retailer wants to sell its products as fast as possible (high inventory turns), collect payments from customers as fast as possible (high receivables turns), but pay suppliers as slowly as possible (low payables turns). The best-case scenario for a retailer is to sell its goods and collect from customers before it even has to pay the supplier. Wal-Mart is one of the best in the business at this: 70 percent of its sales are rung up and paid for before the firm even pays its suppliers. Looking at the components of a retailer’s cash cycle tells us a great deal. A retailer with increasing days in inventory (and decreasing inventory turns) is likely stocking its shelves with merchandise that is out of favor. This leads to excess inventory, clearance sales, and, usually, declining sales and stock prices. Days in receivables is the least important part of the cash conversion cycle for retailers because most stores either collect cash directly from customers at the time of the sale or sell off their credit card receivables to banks and other finance companies for a price. Retailers don’t really control this part of the cycle too much. However, some stores, such as Sears and Target, have brought attention to the receivables line because they’ve opted to offer customers credit and manage the receivables themselves. The credit card business is a profitable way to make a buck, but it’s also very complicated, and it’s a completely different business from retail. We’re wary of retailers that try to boost profits by taking on risk in their credit card business because it’s generally not something they’re very good at. If days in inventory and days in receivables illustrate how well a retailer interacts with customers, days payable outstanding shows haw well a retailer negotiates with suppliers. It’s also a great gauge for the strength of a retailer. Wide-moat retailers such as Wal-Mart, Home Depot, and Walgreen optimize credit terms with suppliers because they’re one of the few (if not the only) games in town. For example, 17 percent of P&G’s 2002 sales came from Wal-Mart. The fortunes of many consumer product firms depend on sales to Wal-Mart, so the king of retail has a huge advantage when ordering inventory: it can push for low prices and extended payment terms. Home Depot finally started taking advantage of its competitive position by squeezing suppliers in 2001 and 2002. Days payable outstanding for the home improvement titan has historically been around 25. In 2001, the figure hit 33 days, and by 2002, it exceeded 40 days. By holding on to its cash longer and reducing short-term borrowing needs, Home Depot increased its operating cash flow from an average of $2.4 billion from 1998 to 2000 to $5.6 billion from 2002 to 2003. • Sometimes you never get a second chance to make a good first impression. Retail is a fickle business, and shoppers have plenty of alternatives, so companies have to make a concerted effort to keep stores clean and fresh. Lowe’s has benefited mightily in its battle with Home Depot because its stores are widely perceived to be more aesthetically pleasing and easier to navigate. Home Depot is reinvesting in its stores, but as we mentioned in the restaurant section, maintenance and renovation is easier than reinvention. • Keep an eye out for store traffic. You don’t want to see a traffic bottleneck at the checkout aisles, but you don’t want to see empty parking lots on weekends either. This is particularly true for specialty retail companies such as clothing stores that cater to a particular demographic. Traffic to teen hot spot Abercrombie & Fitch and women’s outfitter Chicos FAS has remained relatively robust even in times of lax consumer spending. These stores have carved out a brand identity and won customer loyalty, and their stock prices held up during the tough market conditions in 2001 and 2002. Remember, though, specialty retailers have a much shorter shelf life than traditional retailers do, so these investments have to be monitored much more closely. • Successful retailers have a positive employee culture. After all, retail is about customer service—period. Sam Walton helped build Wal-Mart into the largest retailer (and largest company) in the world based on sales using the premise that the customer is always right. During its growth heyday in the 1990s, Home Depot’s employees were always visible and customers usually walked away satisfied. In 2001 and 2002, Home Depot’s service waned noticeably, largely due to an influx of part-time employees who didn’t have the same connection to the company. As we’ve mentioned numerous times in earlier chapters, great companies in attractive industries generate returns on invested capital that far exceed the cost of capital. However, retail is generally a very low-return business with low or no barriers to entry. Retail bellwethers Wal-Mart and Walgreen earn little more than 3 cents profit for every dollar of sales, so store management is critical. The problem is that many retailers don’t execute as flawlessly as these two and flame out as soon as trouble hits. The sector is rampant with competition. Think of all the specialty apparel shops that try to imitate Abercrombie &2 Fitch and Gap. A few succeed; most fail, but the point is that nothing exists to prevent new concepts and stores from being launched. There are few, if any, barriers to entry. Customers may be swayed to buy a cool $50 sweater, but they’ll quickly go to the store next door if the same sweater can be had for $40. 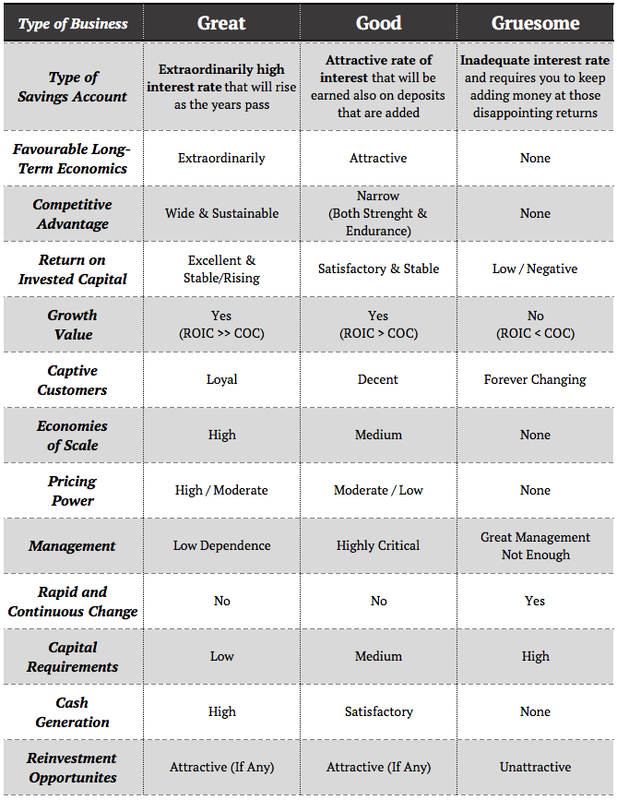 The primary way a firm can build an economic moat in the sector is to be the low-cost leader. Wal-Mart sells items that can be purchased just about anywhere, but it sells it all for less than the competition, and consumers keep coming back for the bargains. Others may try to imitate Wal-Mart’s strategy in the short run but lack the economies of scale to remain profitable employing the strategy in the long run. • Most consumer services concepts fall in the long run, so any investment in a company in the speculative or aggressive growth stage of the business life cycle needs to be monitored more closely than the average stock investment. • Beware of stocks that have already priced in lofty growth expectations. You can make money if you get in early enough, but you can also lose your shirt on the stock’s rapid downslide. • The sector is rife with low switching costs. Companies that establish store loyalty or store dependence are very attractive. Tiffany’s is a good example; it faces limited competition in the retail jewelry market. 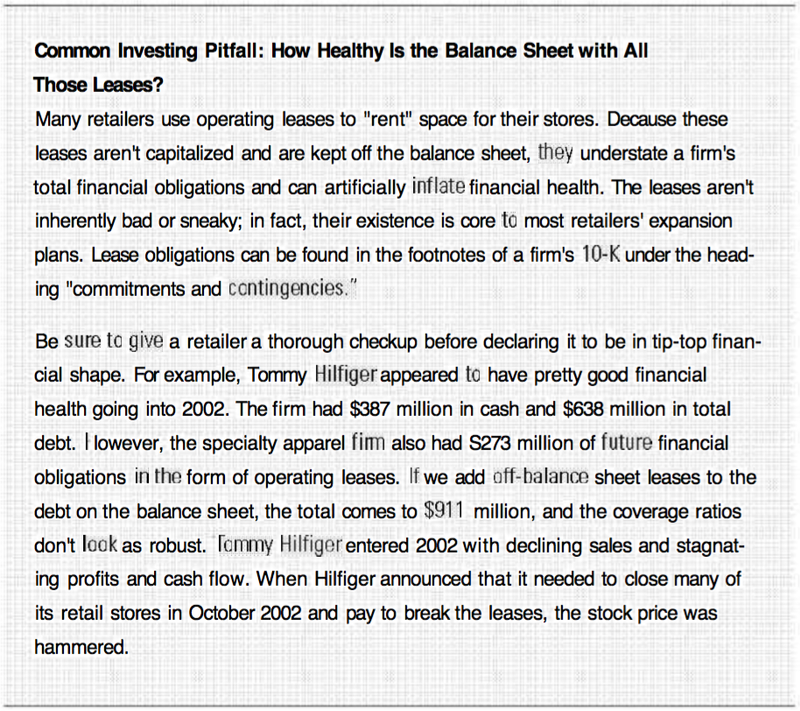 • Make sure to compare inventory and payables turns to determine which retailers are superior operators. Companies that know what their customers want and how to exploit their negotiating power are more likely to make solid bets in the sector. • Keep an eye on those off-balance sheet obligations. Many retailers have little or no debt on the books, but their overall financial health might not be that good. • Look for a buying opportunity when a solid company releases poor monthly or quarterly sales numbers. Many investors overreact to one month’s worth of bad same-store sales results, and the reason might just be bad weather or an overly difficult comparison to the prior-year period. Focus on the fundamentals of the business and not the emotion of the stock. • Companies also tend to move in tandem when news comes out about the entire sector falls—keep that watch list handy. I hope that reading through this post, and reflecting on the content, made you a little wiser. The concept of earning power was mentioned five times by Warren Buffett in his 2015 shareholder letter. It first appears on page four in Buffett’s review of the highlights of the year at Berkshire (emphasis added). The second time Buffett talks about earning power in his discussion about Precision Castparts Corp., an acquisition that closed in the beginning of 2016. Next year, I will be discussing the “Powerhouse Six.” The newcomer will be Precision Castparts Corp. (“PCC”), a business that we purchased a month ago for more than $32 billion of cash. PCC fits perfectly into the Berkshire model and will substantially increase our normalized per-share earning power. The third time earning power is mentioned by Buffett is on connection to how future managers will proceed to build Berkshire’s intrinsic value. Considering this favorable tailwind, Berkshire (and, to be sure, a great many other businesses) will almost certainly prosper. The managers who succeed Charlie and me will build Berkshire’s per-share intrinsic value by following our simple blueprint of: (1) constantly improving the basic earning power of our many subsidiaries; (2) further increasing their earnings through bolt-on acquisitions; (3) benefiting from the growth of our investees; (4) repurchasing Berkshire shares when they are available at a meaningful discount from intrinsic value; and (5) making an occasional large acquisition. Management will also try to maximize results for you by rarely, if ever, issuing Berkshire shares. The fourth time is when Buffett discusses the importance of long-term debt as a founding source for the long-lived and regulated assets that Berkshire’s regulated, capital-intensive businesses own. The fifth, and last, time that earning power occurs is in connection to Buffetts discussion about how Berkshire managers think about how to grow their different businesses and adapt to changing circumstances in the competitive landscape. So, Buffett clearly seems to focus on earning power as a highly important concept when it comes to looking at the different businesses in Berkshire’s possession. From having read the above quotations from the most recent shareholder letter, let’s have a closer look at the concept of earning power, and why it’s important to know be familiar with it. In The Aggressive Conservative Investor Marty Whitman discusses the importance and implications of distinguishing between earnings and earning power. Given the varied economic definitions of earnings, it may be wise to distinguish between earnings and earning power. By “earnings” is meant only reported accounting earnings. On the other hand, in referring to “earning power” the stress is on wealth creation. There is no need to equate a past earnings record with earning power. There is no a priori reason to view accounting earnings as the best indicator of earning power. Among other things, the amount of resources in the business at a given moment may be as good or a better indicator of earning power. Graham & Dodd also put down their thoughts on earning power, for instance in Security Analysis (quotation below from the sixth edition). Intrinsic Value vs. Price. From the foregoing examples it will be seen that the work of the securities analyst is not without concrete results of considerable practical value, and that it is applicable to a wide variety of situations. In all of these instances he appears to be concerned with the intrinsic value of the security and more particularly with the discovery of discrepancies between the intrinsic value and the market price. We must recognize, however, that intrinsic value is an elusive concept. In general terms it is understood to be that value which is justified by the facts, e.g., the assets, earnings, dividends, definite prospects, as distinct, let us say, from market quotations established by artificial manipulation or distorted by psychological excesses. But it is a great mistake to imagine that intrinsic value is as definite and as determinable as is the market price. Some time ago intrinsic value (in the case of a common stock) was thought to be about the same thing as “book value,” i.e., it was equal to the net assets of the business, fairly priced. This view of intrinsic value was quite definite, but it proved almost worthless as a practical matter because neither the average earnings nor the average market price evinced any tendency to be governed by the book value. Intrinsic Value and “Earning Power.” Hence this idea was superseded by a newer view, viz., that the intrinsic value of a business was determined by its earning power. But the phrase “earning power” must imply a fairly confident expectation of certain future results. It is not sufficient to know what the past earnings have averaged, or even that they disclose a definite line of growth or decline. There must be plausible grounds for believing that this average or this trend is a dependable guide to the future. Experience has shown only too forcibly that in many instances this is far from true. This means that the concept of “earning power,” expressed as a definite figure, and the derived concept of intrinsic value, as something equally definite and ascertainable, cannot be safely accepted as a general premise of security analysis. Example: To make this reasoning clearer, let us consider a concrete and typical example. What would we mean by the intrinsic value of J. I. 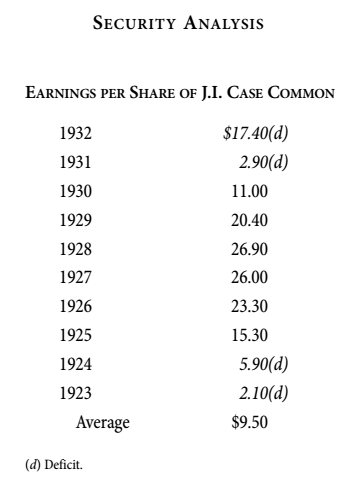 Case Company common, as analyzed, say, early in 1933? The market price was $30; the asset value per share was $176; no dividend was being paid; the average earnings for ten years had been $9.50 per share; the results for 1932 had shown a deficit of $17 per share. If we followed a customary method of appraisal, we might take the average earnings per share of common for ten years, multiply this average by ten, and arrive at an intrinsic value of $95. But let us examine the individual figures which make up this ten-year average. They are as shown in the table on page 66. The average of $9.50 is obviously nothing more than an arithmetical resultant from ten unrelated figures. It can hardly be urged that this average is in any way representative of typical conditions in the past or representative of what may be expected in the future. Hence any figure of “real” or intrinsic value derived from this average must be characterized as equally accidental or artificial. Today Buffett appeared on CNBC where he was interviewed by Becky Quick. One of the topics they talked about was earning power. Becky Quick: Well, let’s start off talking with just the report itself in terms of how the businesses are doing. It was a strong year, profit was up sharply. How would you just state the overall business is doing right now? Warren Buffett: Well most of the businesses did pretty well last year. And our goal is to add to the fundamental earning power every year. That doesn’t mean we think that earnings will go up every year, because sometimes you’ll be in recession or something of the sort. But we wanna feel at the end of the year we got more fundamental earning power on an average basis going forward than the start of the year. And since we retain all our earnings we ought to do that, it’s kind of silly to retain earnings just to stay flat. So every year, last year we were able to add a couple important businesses. They didn’t actually get done till after the year-end. And they will add to our earning power, and then we try to develop further the earning power of the businesses we already have, and that’s the goal year after year. Becky Quick: The big addition for this year will be Precision Castparts. Warren Buffett: Yeah, it didn’t close until about a month after the end of the year. Becky Quick: You talk about the powerhouse five. Warren Buffett: Yeah, now we’re gonna have the powerhouse six. And someday we’ll have the powerhouse eighty I hope. Click image below to watch the interview. Last Friday Herb Greenberg, Pacific Square Research, shared his perspective to why S&P earnings from 2015 may be worse than reported. Click image below to watch the interview. Disclosure: I have a position in the BRK.B stock mentioned. I am not receiving compensation for it. I have no business relationship with the company. This article is informational and is in my own personal opinion. Always do your own due diligence and contact a financial professional before executing any trades or investments.